Stockland: Construction on a new 22-hectare lake at Stockland’s Newport community on the Redcliffe Peninsula has passed the half-way mark with around 1,420,000 cubic metres of earth excavated from the site so far. David Laner, Stockland’s Acting Queensland General Manager for Residential, said work was progressing well on the lake, which will be the central feature of the vibrant new bayside community. “This is the jewel in the crown of Newport and we’re delighted with the progress being made on the lake excavation – it’s exciting to see our vision becoming a reality,” Mr Laner said. 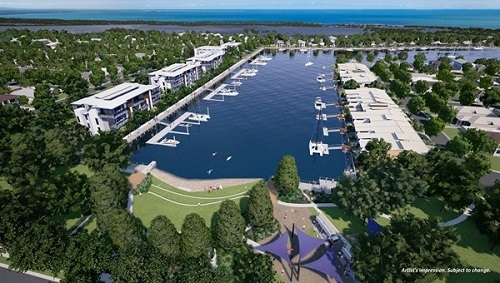 “The new lake will form the central feature of our new community, providing a fantastic recreational facility for people who enjoy boating and water sports with direct access to Moreton Bay. In all some two million cubic metres of earth will be excavated to create a 14-metre-deep non-tidal lake. On a typical day there are around 160 personnel on site and 60 earthmoving machines in operation. Newport is now home to almost 600 residents with new families moving in every week. Upon completion, the community will be home to more than 5,000 residents with almost 2,000 dwellings and a future town centre with retail. It will also feature leafy foreshore parks, kilometres of cycling and walking paths and easy access to schools, shops, health facilities, public transport and beaches. Non-waterfront lots at Newport currently start from $269,900 for a 294 square metre homesite, with waterfront lots ranging from $591,900 for a 336 square metre lot to $694,900 for a 448 square metre lot. Development of the Newport Retirement Village is tracking well with the 125 architecturally designed apartments set to see the first resident move in by August 2019. Designed for the active retiree, the Newport Retirement Village will offer residents a number of high-end facilities including a wellness hub with a gym and swimming pool, billiards room, wi-fi enabled library and an alfresco barbeque area featuring a living community table to grow herbs for use when cooking.